Practical Procedures in Aesthetic Dentistry presents a comprehensive collection of videos demonstrating clinical techniques in aesthetic and restorative dentistry, and is accompanied by a handbook summarising the key points of each procedure. Subir Banerji is a Private Dental Practitioner, and a Senior Clinical Teacher and Director of the Aesthetic Dentistry MSc programme at King's College London Dental Institute, UK. He is also a Board Member of the Academy of Dental Excellence. Shamir B. Mehta is a Dental Practitioner, and a Senior Clinical Teacher and Deputy Director of the Aesthetic Dentistry MSc programme at King's College London Dental Institute, UK. He is also a Faculty Member of the Academy of Dental Excellence and an Independent Clinical Advisor/Expert. Christopher C.K. Ho is a Private Dental Practitioner in Sydney, Australia. Previously a Senior Clinical Associate at the University of Sydney, Christopher is a Visiting Clinical Teacher at King's College London Dental Institute, UK. He is also a Faculty Member of the Global Institute for Dental Education and a Board Member of the Academy of Dental Excellence. offering readers considerably more than the title implies. management of toothwear are particularly groundbreaking. 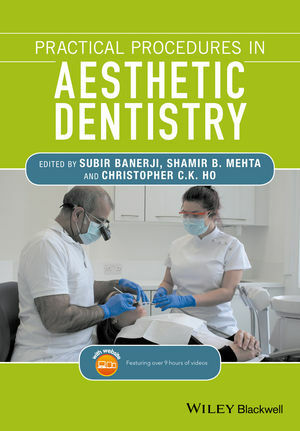 The authors’ practical guides,built up over three decades of clinical dentistry and teaching, combined with their ability to simplify tricky scientific and technological concepts, make the book equally suitable for both senior undergraduates/newly qualified dentists and experienced experts wishing to refine their knowledge and skills in aesthetic restorative dentistry.